Total tour time from pickup to drop-off is 8 hours. 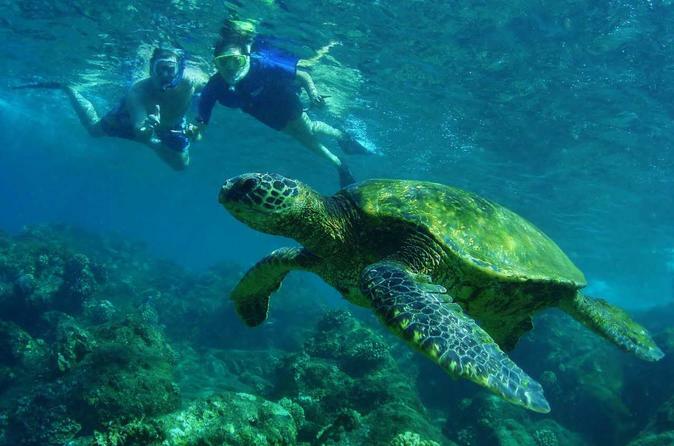 This is the number one snorkeling tour on Oahu! One trained life guard for every 10 guests, our guides will share how to interact and better yet how NOT to interact with the beautiful and protected sea turtles. This tour will relax you, rejuvenate you and inspire you. This is the perfect blend of relaxation, education, ocean therapy and awe. A small group experience takes you to the fabled North Shore and allows guests to enjoy several amazing and scenic spots while our expert guides share some of their stories and their history here in the islands along with incredible moolelo (stories) of ancient Hawaii. Sit back and enjoy this unique guided tour as our expert guides share their home with you!